This paper presents a critical account of the representation of immigration in the Brexit corpus—a collective corpus of 108,452,923 words compiled mostly from blogs, tweets, and daily news related to Brexit debate. The study follows the methodological synergy approach proposed by Bakeret al.  (2008),a heuristic methodological approach that combines methods of discourse analysis and corpus-assisted statistical tools including keyword, collocation, and concordance analysis. Drawing on this methodological synergy approach, the investigation yields significant findings contextualized within the socio-economic-political context of the European Union (EU) leave referendum to trace how the issue of immigration is represented in the discourses of the Remain and Leave campaigns. The frequency results show that immigration is one of the most salient topics in the Brexit corpus. 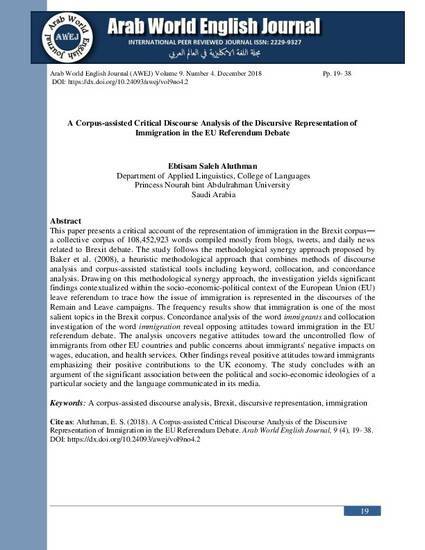 Concordance analysis of the word immigrantsand collocation investigation of the word immigration reveal opposing attitudes toward immigration in the EU referendum debate. The analysis uncovers negative attitudes toward the uncontrolled flow of immigrants from other EU countries and public concerns about immigrants' negative impacts on wages, education, and health services. Other findings reveal positive attitudes toward immigrants emphasizing their positive contributions to the UK economy. The study concludes with an argument of the significant association between the political and socio-economic ideologies of a particular society and the language communicated in its media.